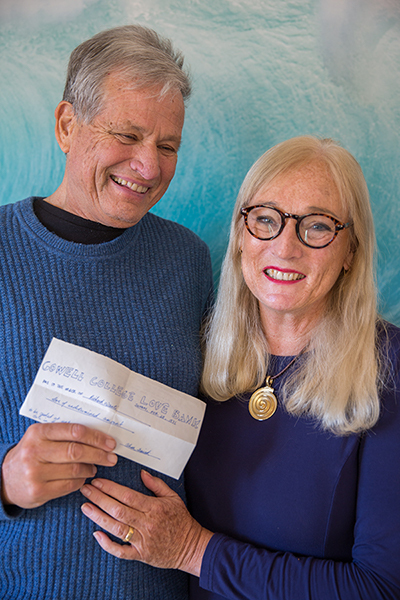 Rich Vicenti and Alesa Lightbourne were interested in each other when they were students at Cowell College in the early 1970s, but Lightbourne was not available... until Vicenti contacted her nearly 40 years later. Rich Vicenti and Alesa Lightbourne with the love raincheck Lightbourne gave him when they were undergraduates. Photo: Carolyn Lagattuta. As an undergraduate at Cowell College, Alesa Lightbourne gave Rich Vicenti, a Cowell RA, a raincheck drawing on the "Cowell College Love Bank" and promising her love at an undetermined time in the future. They went separate ways. They both started families and built careers. And 39 years later they were finally both single at the same time. Lightbourne was teaching at a middle school in Iraq. She reconnected with Vicenti on Facebook. They began Skyping every day. When Vicenti sent her a photo of her raincheck, the message was clear. Now married, Vicenti and Lightbourne live in Santa Cruz. "Sharing a history together is like a firm foundation," Lightbourne says. "We can crack jokes about Cowell and the 60s and 70s, and we both get it." Lightbourne has written an award-winning novel, The Kurdish Bike, inspired by the Kurdish women she came to know while working in Iraq.